I modeled this gift guide after the much loved Oprah's Favorite Things list. If you don't know what Oprah's Favorite Things is it's a list that Oprah releases every year during the holiday season (usually at the beginning of November) in which she shares her favorite items from the past year as a big gift guide! She started doing it when she had her talk show and has continued the tradition every year since and the list is always highly anticipated. 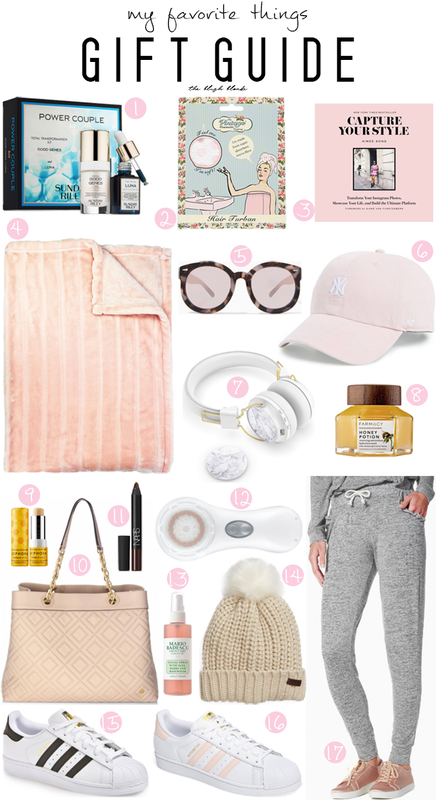 So this year I took inspiration from her and compiled a list of my favorite things from 2017 that would make great gifts. All of these are items I've loved throughout the year and they are sure to make anyone you're gifting them to very happy! I've talked about Sunday Riley's Luna Sleeping Night Oil and Good Genes on here numerous times this past year because they are amazing and this set pairs the two together in a convenient kit. Luna is a retinoid oil that moisturizes, shrinks pores, reduces wrinkles, calms redness, and improves skin smoothness. Good Genes is a pharmaceutical-grade, lactic-acid-based treatment that works to exfoliate, plump fine lines, reduce hyperpigmentation, increase circulation, and firm skin for instant radiance. This is the perfect gift for any skincare lovers you know! Using a towel turban on my hair instead of a tradition terrycloth towel has been a game changer for me this year. The microfiber material these turbans are made of helps your hair to dry a lot faster and is much more gentle on your hair then a regular towel. If you or someone you're gifting this year are trying to grow out your hair or repair damaged hair this is definitely a must have. I actually got this book from my sister last year for Christmas and it is perfect for anyone who is Instagram obsessed or loves fashion! It's written by blogger/Instagram aficionado Aimee Song and is about how to use Instagram to create a brand, a loyal following, unique content, and everything else you need to know to take your Instagram account to the next level. It's also worth noting that it makes for a super chic coffee table book as well! Oh my gosh I am all about faux fur blankets this year and am lusting after this pretty pink one. I love having a blanket for when I'm working on blog stuff, watching TV, and I even sometimes land up bringing one to bed because they're just so soft and cozy. A fuzzy or faux fur blanket is perfect for anyone on your list because everyone loves having a soft blanket (in college I got my best guy friend one and he loved it). While I love the one I have pictured here I recommend checking Costco (this is where we got the ones we currently have at my house and they're so nice) and HomeGoods because both places usually have great options at very reasonable prices! So I've always been kind of a sunglass snob (I would only wear designer ones), but this year I was sent some sunglasses from Charming Charlie and could not stop wearing them! They have so many cute options and designer look-alikes and they're super inexpensive which means you can get a few pairs. I have never really been one for baseball caps, but recently I've become obsessed with them. They're are so many cute ones right now that you can find one for just about any outfit. I've been wearing my pink Yankees cap on repeat lately though because it goes with most things and it's great for hiding your hair when you need to wash it! These headphones do an amazing job at blocking out noise with their studio quality sound and feel super comfy on my ears (the leather they're made of is butter soft, I'm obsessed with it). They also fit in so easily with my everyday life and fit into my aesthetic really well. I especially love the marble caps I got to make them truly perfect for me and very on trend. Use the code THEBLUSHBLONDE when buying these for 15% off your purchases! This mask combines honey, royal jelly, propolis, and Farmacy's Echinacea GreenEnvy to hydrate, gently cleanse, and provide antioxidants to your skin. I've found that it has even helped to clear up my skin when I'm having a breakout. I think the best part about this mask though is that it warms when you rub it onto your face, which makes the experience feel super luxe. This lip scrub in stick form features gentle sugar exfoliants that works to remove any dead skin or flakes from your lips. My lips tend to get dry and flaky, especially in the winter, so this is amazing to get them smooth and ready for lipstick. My favorite part about this though is that since it's a stick it's less messy and more convenient to use than other lip scrubs I've tried. This year I have been loving Tory Burch handbags! They're gorgeous, well made, and super luxe. I have a bag similar to this one that I absolutely love and have worn so much this year. This is my absolute favorite lipstick and has been for the last few years. It has gorgeous color payoff and a beautiful matte finish, which makes for the perfect lipstick in my opinion. It also has incredible staying power which is always a big plus in my book! The color Train Bleu (pictured above) is my favorite. As a major lover of skincare this one is really no surprise! Using a facial brush with your cleanser a few times a week can drastically change your skin for the better. This item has a cult following and is something any beauty lover needs. The fun part about this is that it comes in a wide variety of colors, which means you can get the person you're gifting it to's favorite one! Learn more about it here. I am completely in love with this refreshing spray and have been for a while now. It is a great way to boost hydration and radiance throughout the day. It calms and soothes skin and is especially important during the drying winter months. This would make for a great stocking stuffer! 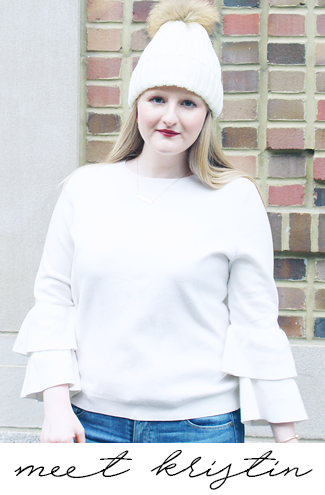 I can't get enough of adorable pom pom hats for the winter. They are the cutest accessory and will definitely help to keep you warm. I'm especially loving this neutral one that will go with everything! I have been wearing these nonstop since I got a pair in January. They are so comfortable and also really on trend right now! I currently have them in black and white, but I love them so much that I definitely want them in pink too. If pink isn't your color they come in a bunch of other colors too! If you follow me on social media then you've most likely seen me talking about how much I love these joggers from Charming Charlie. These are ridiculously soft and cozy and I literally live in them. Joggers are also huge right now so they're on trend and they're also super inexpensive, which makes them the perfect gift! These are some great gift ideas! I'm definitely going to be trying out that lip scrub! Love those joggers! I've been trying to find the perfect pair. I might have to check these out! This list is perfect for anyone who loves a bit of self care! I want the hats! Love all of these!! I need a new pair of headphones, these are so perfect. I really want #3! It's on my Christmas wish list too! What an awesome guide, you have so many great choices. I TOTALLY want that Aimee Song book! So many great things! I love that facial spray and that throw looks so cozy! Love your gift guide! Those headphones are too cute. And I love giving friends things like lip scrubs or masks for Christmas – little treat yourself gifts that they might not spend money on themselves! Great list! Farmacy Honey Potion is one of my favorites! That is such great idea for a gift guide! I love the honey potion mask and you really can't go wrong with sunday riley. I always love reading gift guides! They give me so many ideas for my husband haha! Such great ideas!! I love the pink super stars, they're super girly and cute! Omg I want all of these suggestions haha, you have great style girl!